After lunch, the group headed to another Gammon project, the Havelock Station. This station, like the Mayflower, will be part of the Thomson-East Coast Line and is scheduled to be completed December 30, 2020. The project consists of the station box, five entrances, and a pedestrian walkway. 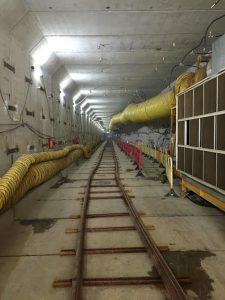 The project’s main draw is its square tunnel-boring machine, the first of its kind to be used in Singapore. The STBM is owned by the Land Transit Authority, the project owner. It is designed to be used for more than one project. For this station, the STBM was used for a 150-meter pedestrian walkway. The original plan was to use the cut and cover method for the walkway, but the Land Transit Authority decided to invest in the STBM because they believe it will lower the overall costs of future projects. The square design worked well for this project, since it requires a smaller machine than the standard circular design would. This is important because the tunnel is relatively near to the surface, so the less soil that is disturbed, the better. The STBM works by using jacks to push cutters and precast sections forward through the tunnel. Once the jacks push a section into place, they retract and another section is lowered down into the tunnel. On this project, Gammon also used an intermittent jacking system, where jacks were periodically installed in the tunnel. Using this jacking system helps to reduce friction on the sections as they are pushed forwards. This type of machine only works for straight tunnels because it is pushed from the back. The precast sections are visible in the picture looking down the length of the tunnel. Once the jacks push a section into place, they retract and another section is lowered down into the tunnel. On this project, Gammon also used an intermittent jacking system, where jacks were periodically installed in the tunnel. Using this jacking system helps to reduce friction on the sections as they are pushed forwards. This type of machine only works for straight tunnels because it is pushed from the back. The precast sections are visible in the picture looking down the length of the tunnel. 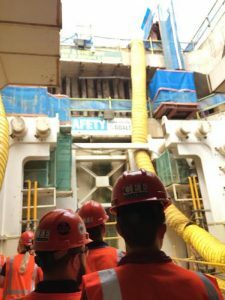 Once we had a brief introduction to the boring machine, the Senior Tunnel Engineer, Phillip, took us down into the tunnel. We walked the length of the tunnel to where the main drives were. Phillip explained to us that the drilling was completed and they were dissembling the drives, pulling them backwards out of the tunnel, and refurbishing them for future use. The hollow square sections used to jack the machine forward will be left in place. We watched the crews working to remove the drives while asking Phillip questions about the process and machine. We learned that one particular site challenge was boring under a live roadway. Pressures and progress had to be carefully monitored so as to not disturb the roadway just six meters above.We ended the site visit by walking to see birds-eye views of some of the site entrances. We did not view the station at this location, since we had already seen the inside of a station box at the Mayflower, and this station was at a much earlier stage in its construction. Our day as a group ended with a welcome dinner and a presentation by our host, Daisy. We are staying in the Malay quarter of town, and walked a short distance to eat at a Malay restaurant. The meal was basically a sampler of many types of dishes, and we all dove right in. Minus Jinesh, our resident vegetarian, who had his own special platter, and even his own table. I loved the shredded coconut, but told everyone it wasn’t good so I could have more (sorry Bill). We got a small dessert, which was delicious, but no one knows exactly what it was we ate. The group split up up after dinner, either to go exploring downtown or to see the night safari. Everyone was ready to catch some zzz’s by end of our long, full day.